Fiat India has just launched the Punto Pure at Rs 4.49 lakhs for the petrol variant while the diesel variant costs Rs 5.59 lakhs. The Punto Pure is positioned below the Punto Evo and will available in three colours- Exotica Red, Hip-hop Black and White. The launch of the Punto Pure is excellent news for all those Fiat fans who loved the Grande Punto which was discontinued back in 2014. 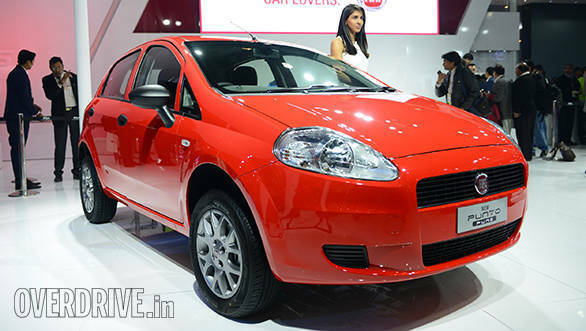 The petrol variant of the Punto Pure gets a 1.2-litre Fire unit, which makes a maximum power of 68PS and 96Nm. The diesel variant gets a 1.3-litre multi-jet mill which produces 76PS and 197Nm. On both variants the engine is mated to a 5-speed manual transmission. Speaking on the occasion Kevin Flynn, president and managing director, Fiat Chrysler Automobiles India, said "the success story of the Grande Punto has been impeccable. It received a warm welcome during its launch. The Italian design dynamics and flair was loved and admired by many. Today, we at FCA India are extremely thrilled to present the Punto Pure- the Italian masterpiece that promises the same agility and ride quality at an affordable price and low cost of ownership." The Fiat Punto Pure measures 3987mm in length, 1687mm in width and 1495mm in height. It comes equipped with 14-inch steel wheels as standard along with black coloured wing mirrors and door handles. Additionally it gets body colored bumpers and rear fog lamps.